Jean Kerr is the author of four cookbooks and a contributing editor at The Cook's Cook. The thought of using a kitchen scale used to seem a bit too exacting for me, as I’m not an exacting kind of cook. But a weekend of baking classes convinced me otherwise. I learned that a cup of flour can vary by an ounce or more in weight, depending on how it’s scooped and other factors. 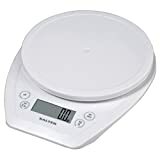 I use my Salter kitchen scale often now. Even though I’ll probably never be an ace baker, it has improved my chances of creating pretty decent cookies, scones and muffins. And since it weighs ingredients in ounces or grams, it makes it easy to convert recipes to or from metric measurements. Jean Kerr is the former Editor and founder of Northeast FLAVOR magazine, which was named one of the top ten new magazines in the United States in its first year of publication. She is the author of four cookbooks and is a two-time Foreword magazine Book of the Year nominee. She has written for Yankee magazine, is a regular contributor to Cruising World and is currently a Contributing Editor to The Cook’s Cook.